Log into your Impact Radius portal. In the search box, type in the word “partner” and hit Enter. 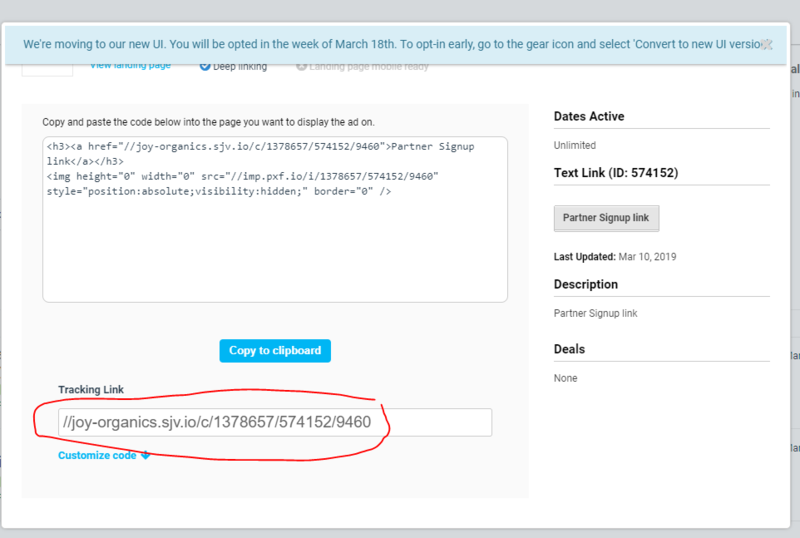 You will now see two Partner referral links. One link goes to the Joy Organics Affiliate page and the second goes directly to the application page. Both links track so this is just a personal preference. If your referring partner is qualified and ready to sign up, I recommend the application page. If you have a link on your site but have not communicated directly with the potential partner, I recommend the Joy Organics page. My referral did not click on my link. How can I add them to my account? Unfortunately, there is no way to manually add sub affiliates to your account. It is essential you communicate with your referral that s/he must click on your link. My sub affiliate was declined. Why? All affiliates must have a website in the health or wellness niche or at least 1000 followers on social media in order to be accepted into the program. How do I see if a partner signed up on me? The only way to confirm a partner is signed up under you is when s/he starts producing sales. Your partner referral sales will appear in your report AFTER the locking period has been completed. The locking period is 30 days. I put a request in to Impact for a reporting feature that allows you to see your referrals. As soon as it is live, I will let everyone know.